Leaving a puppy alone during the day is doable, but you have to do it right. Puppies need much more supervision than adult dogs, which limits you when it comes to leaving them alone. So remember to take that into consideration. Unfortunately, many of us have to work outside the home. As much as we’d love to stay home cuddling our puppies all day, someone has to keep food on the table (and dog food in the bowls)! Today, we’ll talk about leaving a puppy alone during the day, and what you need to do to make it safe and successful! One of the most important things to remember about puppies is that they aren’t just miniature dogs. They require extra supervision, time, and potty breaks. They can also be destructive little buggers when they’re bored or scared, so you have to have a game plan. Related: Is It Okay to Leave a Dog Alone for the Weekend? One of the best things you can do with any puppy is crate training. Crate training allows you to safely leave your pup alone for period of time during the day. Crate train your puppy, making the crate a safe place that your puppy loves to be in. That way when you’re gone, your puppy will feel safe and secure. This cuts down on destructive behavior as well as preventing potty messes throughout the house. Looking for more tips? Check out our guide to the do’s and don’ts of crate training! You can only leave a puppy alone for so long. Those little guys have smaller bladders and less control over those bladders than adult dogs. 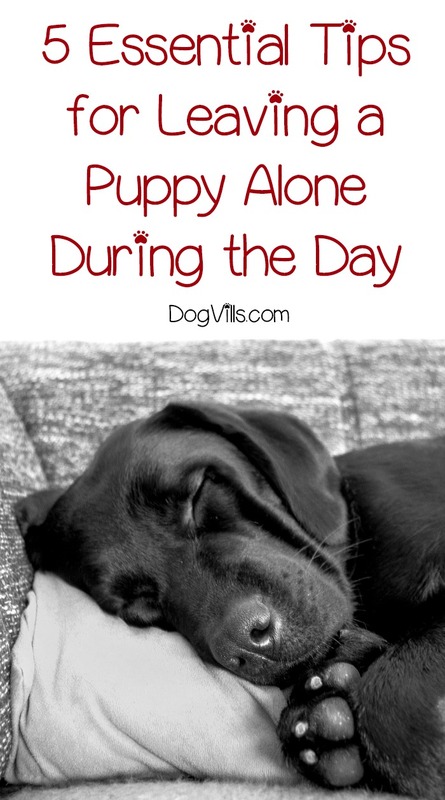 When leaving a puppy alone during the day, you’ll need to either have a friend stop over every 2 to 3 hours to check in on your pup and take him for a walk or hire someone to do it. Otherwise, your puppy either gets very uncomfortable, makes a potty mess all in his crate, or both. If you do need to hire a dog walker, you’ll want to make sure they’re trustworthy. Handing over your house keys and your dog can be a little terrifying. I suggest talking to your vet, family, and friends for recommendations. Before you hand over those keys, ask for references (and actually check them). You can also go through a service that runs background checks. It may sound extreme to get a background check for a dog walker, but remember, they’ll have access to your home. Related: Should you wake your puppy up to pee at night? It’s not a good idea to give your pup free reign of the house while you’re gone. Not only is this completely unsafe for your pup, but also for your valuables! Puppies chew by nature, and when they’re bored or scared, they chew even more. When leaving a puppy alone at home without a crate, opt for a laundry room, mud room, or gated kitchen area. These areas almost always have tile, which is easy to clean in the event of a mess. Make sure you block off or unplug any dangerous wires that your pup could chew. You’ll want to leave water for them, however. Just refer to the time limit section above. If you’re crate training, make sure you put the water in a bowl that isn’t easily spilled. You don’t want your pup sitting in a mess for hours. Even if you’re opting for a gated room, you still want to make sure your pup can’t dump his water bowl. Even if your puppy is crate trained, on the off chance that the door isn’t secured or he gets out, you’ll want to ensure that he can’t get into anything dangerous. Just as you would with a baby, protect your pup by installing baby latches on cabinets and ensuring that anything dangerous or toxic is kept up and away from exploring mouths and paws. For more tips on this subject, read our puppy proofing your home article. It’s important to have everything in place when leaving a puppy alone during the day. Just make sure that your puppy is in a safe environment free of dangers and toxins, and that you leave him in his crate or an area that is easily cleaned. In addition, be sure either you can get home in an hour or two or that someone else can. If you do that, you should be okay. Do you work outside the home? Give us your favorite tips for leaving a puppy alone during the day!